Friday: Launch party for Widow Jane Whiskey, a single barrel bourbon. Cocktails, BBQ, Live Bluegrass music, whiskey distillation and white lightning from the still. At Cacao Prieto Distillery & Chocolate Factory, Red Hook. 7pm-10pm. Friday: Celebrate Cider Week NY with Cheese and Cider at BKLYN Larder. Demo by Eve’s Cidery plus cheese and cider pairings. Park Slope. 5pm-8pm. • Saturday: Flatbush Food Coop, Cortelyou Road, Flatbush. 10am-4pm. • Sunday: PS29 at Baltic Street, Cobble Hill. 10am-4pm. Saturday & Sunday: Last weekend for Brooklyn Waterfront Artists Coalition (BWAC) Affordable Art Auction. Red Hook. Silent auction until 4pm each day. Winners can take art home by 6pm. ♥ Brownstoners of Bedford-Stuyvesant, Inc. 34th annual House Tour. Self-guided tour from 11am-4pm. • Bed-Stuy Bazaar featuring merchandise from Fulton Arts Fair members. 10:30am-3:30pm. Saturday: Prospect Park Food Truck Rally. To date, 16 trucks including: Bongo Brothers, Cupcake Crew, Eddies Pizza, Green Pirate, Kimchi Taco Truck, Mexicue, Milk Truck, Nuchas, Phil’s Steaks, Red Hook Lobster, Rickshaw Truck, Schnitzel & Things, Souvlaki GR , Taïm Mobile, Wafels & Dinges. Sponsored by Prospect Park Alliance and the NYC Food Truck Association. Grand Army Plaza. 11am-5pm. Saturday: 2nd annual Tastes of Brooklyn. Top Brooklyn chefs partner with farmers and seeds in the middle of the Greenmarket at Borough Hall. 11:30am-3pm. Sunday: 3rd annual Havemeyer Sugar Sweets Festival. All-donation bake sale and baking competition to raise funds for The City Reliquary museum and civic organization. Baking Smackdown schedule: The most decadent vegan, 11am. Best fall-flavored treat, 12pm. Best sweet slice, 1pm. Best booze-infused, 2pm. Best In Show, 3pm. Williamsburg, 10am-4pm. Sunday: Pickling Canning Workshop, one of a series of classes in practicing the skills of sustainable living. Everyone who attends will get a jar of something to bring home. Brooklyn Society for Ethical Culture, Park Slope. 1pm-3pm. Sunday: 3rd annual MAC-OFF, a no-holds-barred competition to find the best version of the All-American classic macaroni and cheese. With complementary Ommegang BPA. Huckleberrybar, Williamsburg. 5pm-8pm. Sunday in Outer Brooklyn: Closing day for Changing Hands, Art Without Reservation 3. Contemporary Native North American Art from the Northeast and Southeast. Museum of Art and Design. “MAD” explores the blur zone between art, design, and craft today. MAD’s history of honoring the relationship between materials and maker is evident in their architecturally-fascinating space at Columbus Circle. Manhattan. 11am-6pm. 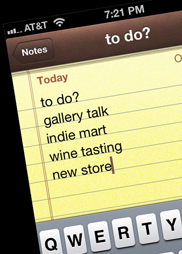 Joy Makon curates Brooklyn Artisan’s Craft & Design coverage and creates the weekend to-do lists.